Metro: None, perhaps Spagna. An alternate is to take Bus 40 or 64 (get off at Piazza San Panteleo, 2 stops past Piazza Venezia, then walk 1 block north from there), or Bus 87 goes from the Colosseum to Via dei Fori Imperiali to the northern edge of Largo di Torre Argentina to east side of Piazza Navona, and back. Piazza Navona is the most famous, popular, and largest piazza in Rome, being home to three large fountains, an obelisk, a church, many restaurants, and the remains of the ancient racing stadium that the piazza inherited its outline from. It is located three blocks west of the Pantheon. 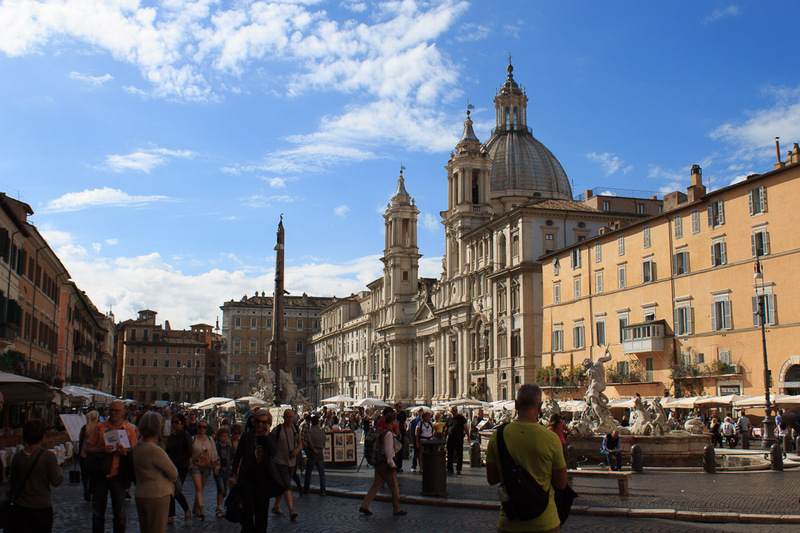 Piazza Navona started out as the Circus Agonalis, a stadium used for athletic contests like foot-races. It was redefined as a public space in the last years of the 15th century, and transformed into a baroque piazza by Innocent X who reigned from 1644 until 1655. In the center stands the Fountain of the Four Rivers topped by the Agonal Obelisk. Just to the west of the obelisk is the church of St. Agnes in Agone. Just north of St. Agnes is the famous restaurant Bar Tre Scalini where you chocaholics like me can get a delicious tartufo. 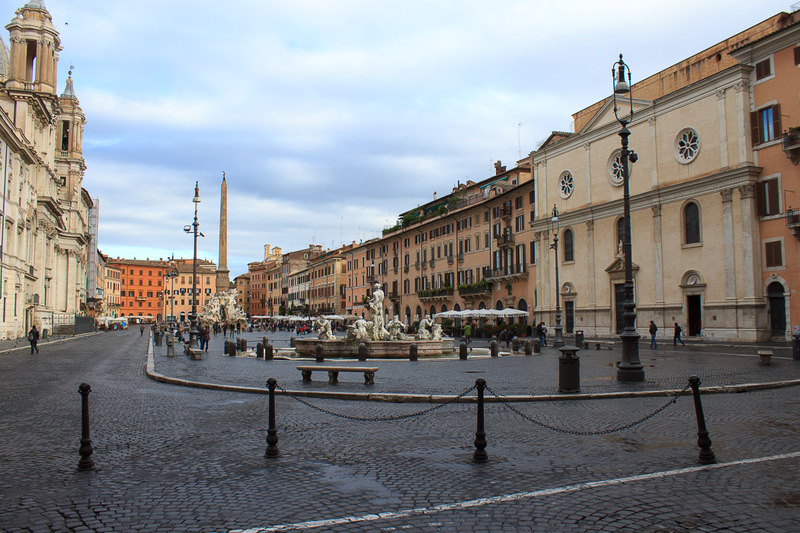 At the southern end of the piazza (the flat end) is the Moor Fountain, which Bernini added the central Moor to. At the northern edge of the piazza (the curved end) is the Fountain of Neptune, to which Antonio della Bitta added the central sculpture of Neptune to balance the Moor Fountain. One block west from the southern end of the piazza is the ancient talking statue of Pasquino, erected in 1501. Like all the talking statues, Romans often left lampoons or derogatory social commentary attached to the statue. A festival for the Epiphany is held in Piazza Navona on the night of January 6th, and this festival is depicted in music by Ottorino Respighi as one of the movements in his Roman Trilogy. Although I've never been in Piazza Navona on the night of that festival, I can easily imagine the party depicted by this music taking place in this granddaddy of Roman piazzas. Nearby sights include the National Museum of Rome - Palazzo Altemps, 2 blocks north, the Column in Piazza de Massimi 1 block southeast, and the 13th century Tor Millina a block or two west. See all Piazza Navona photos.